It's uncanny how many times I've tried mint ice cream recently. Any long time reader of this blog will know of mint's long time absence from my taste testing regiment. You know what the really scary thing is? I think I'm starting to like it! 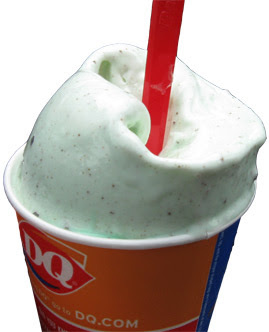 The latest example of this trend is the August Blizzard of the month at DQ: The Girl Scout Thin Mint Cookie Blizzard. While the blizzard before you is overflowing, you will notice an abscence of any large cookie chunks. I've said it before, and I'll say it again: making a blizzard is an artform. You have to blend it just right. Too much, and you'll be left with but -3- thin mint chunks at the bottom. Now this isn't to say I didn't enjoy my treat, I found it quite pleasant actually. It's a nice mild mint flavor, and while the cookies may be obliterated, they still had the chocolate flavor we are all looking for. I have no problem recommending this little treat, and I'm thinking his brother, the Mint Oreo blizzard, is tasty as well. ...Chill lady, it's time for DQ!